Crusaders have signed Linfield defender Billy Joe Burns and Cliftonville striker Diarmuid O'Carroll. Burns has agreed a three-year deal with the Crues while O'Carroll has penned a two-season contract with Cliftonville's North Belfast neighbours. Defender Burns, 25, has been at Linfield for eight years while O'Carroll moved to the Reds in 2012. Meanwhile, new Linfield manager Warren Feeney has handed contract extensions to Jamie Mulgrew and Peter Thompson. Mulgrew has agreed a two-year contract extension while former Northern Ireland striker Thompson has signed a new one-year deal with the Windsor Park club. Feeney said that he was "delighted" to hand new deals to Mulgrew and Thompson. However, the departure of the highly-rated Burns from Windsor Park has to be regarded as a surprise. 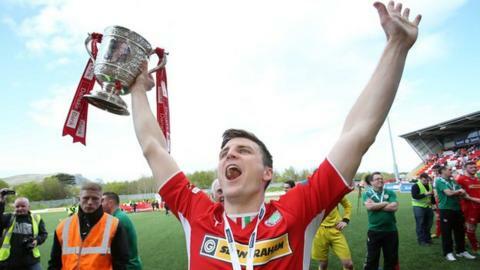 Speaking on Twitter, O'Carroll, 27, said that his time at Cliftonville had "come to an end". O'Carroll scored 12 goals in 68 appearance for Cliftonville although he was not a regular starter because of the outstanding form of Liam Boyce and Joe Gormley during his time at the club. "Two and a half great years, four trophies and some amazing memories," added the Kerry native. "I leave without a bad word to say about players, staff or fans and I want to thank them for all their support." O'Carroll added:"Now I'm looking forward to the future and an exciting new challenge." That new challenge has turned out to be a move to Cliftonville's neighbours. The striker moved from Glenavon to the Reds in January 2012.